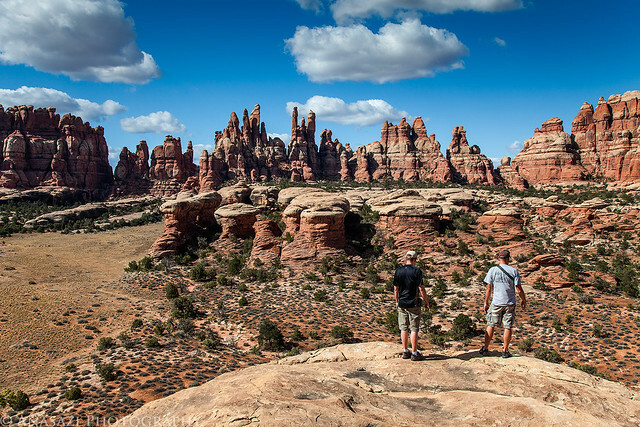 I first tried to explore Horse Canyon in the Needles District of Canyonlands National Park back in 2008 when I camped at Peekaboo with a few friends. Back then the entrance to the canyon had been washed out pretty good and there was a very deep hole blocking vehicle entry. For the past two years I have been checking the condition of the road so that I could finally get back there to start exploring the area, but both the Salt Creek and Horse Canyon roads have been washed out and closed for that long. I have hiked up Salt Creek Canyon twice during those two years, but Horse Canyon was a bit too long for a day hike. A few weeks ago I finally received word that the National Parks Service had finally reopened the roads in Salt Creek and Horse Canyon, so I quickly made plans to get back. I reserved a campsite at Peekaboo for the weekend and invited Jared and Marty to come along. 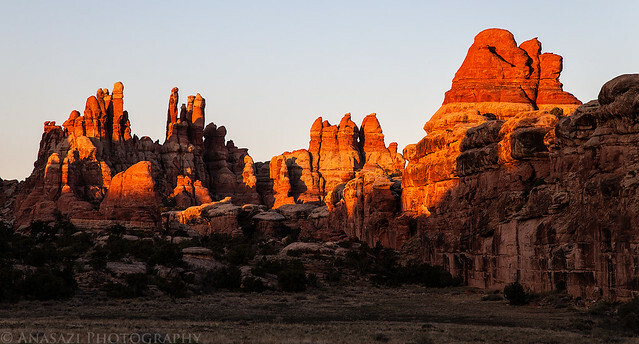 After work on Friday, I drove down to Cottonwood Canyon and setup camp so that I would be close to Canyonlands in the morning and wouldn’t have to do much driving. There were a few rain showers in the evening, but the precipitation stopped before I went to bed, and I had a great night of sleep. In the morning I had a little time to photograph this ruin high up on the canyon wall. I have driven by this site many times and had not been able to find it before. It would have been a long hike up to reach it, but unfortunately I didn’t have the time this morning to try. I will have to return again to climb up to the ruin for some closer photos. After photographing the tower, I continued my drive into the park where I met Jared and Marty at the Needle’s Visitor Center so that we could get our permits and the combination for the lock on the gate. 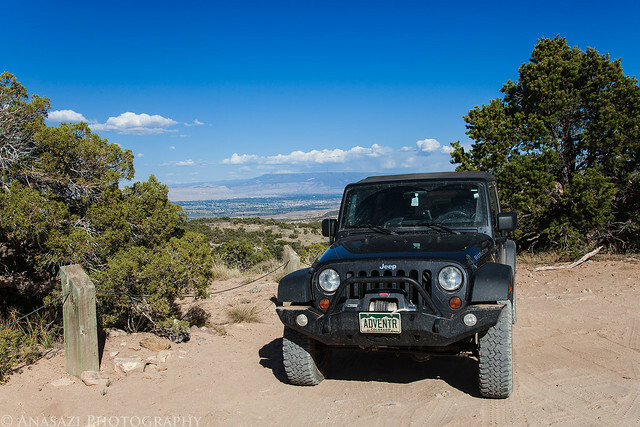 Jared transferred his camping gear into my Jeep and parked his car at the trailhead before we continued through the locked gate into Salt Creek. The drive through the wash was in soft sand as usual, but the debris that had blocked the road in May had been removed. 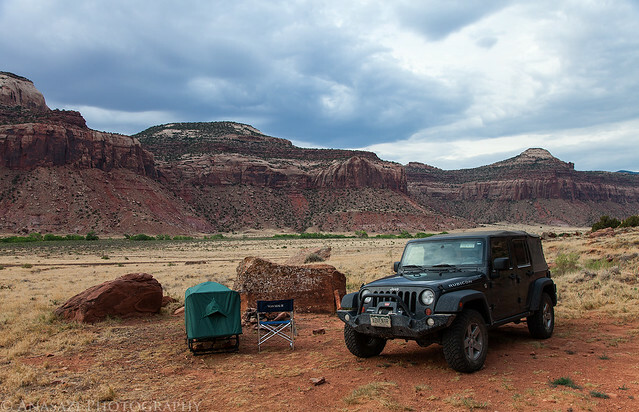 It was nice to be able to avoid this mosquito-infested area by closing the windows of the Jeep 😉 The deep holes that had blocked the entrance to Horse Canyon had also been filled in a bit. 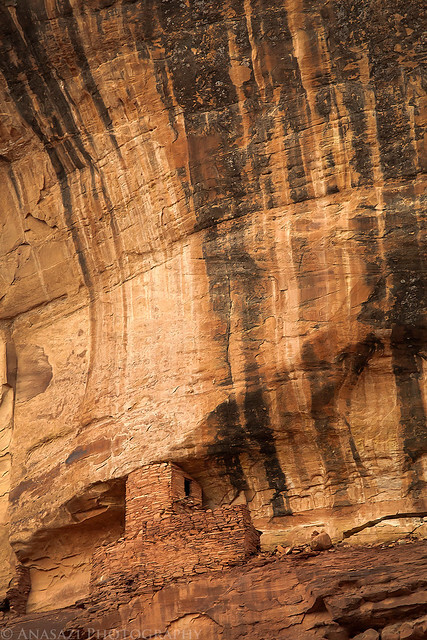 We drove through the holes and brush that was growing in the road and continued up Horse Canyon, where we would be spending much of the day searching for ruins and rock art. We almost missed the remains of a tower near the mouth of the canyon. Good thing Marty spotted this one after we had passed it. 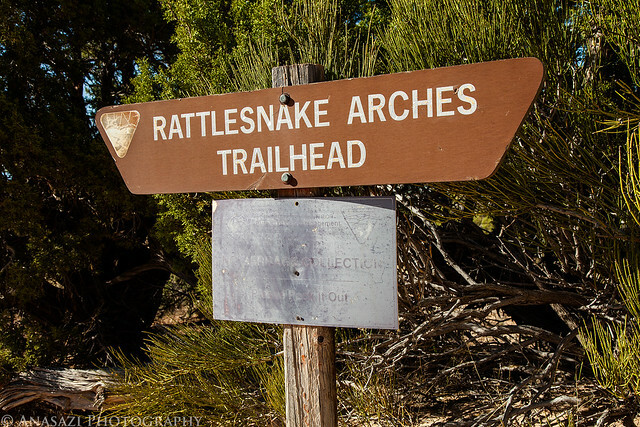 It’s been awhile since I’ve hiked to the arches in Rattlesnake Canyon and I have wanted to return again so that I could try and get some better photos of them. I figured that sunset would probably be the best time to go, and that I should have plenty of time to reach them after work before the sun went down. 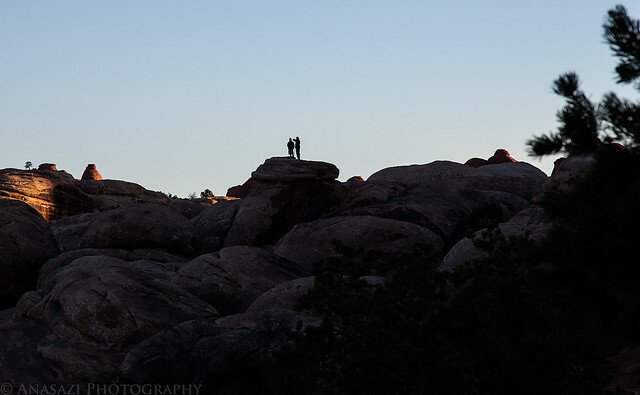 Last week I had originally planned on hiking to them after work on two separate occasions, but as I left work on those days the sky was completely overcast which wouldn’t have made for any good photos, so I cancelled the hike. Finally on Tuesday the conditions were looking good, so I grabbed a quick dinner and drove to the upper trailhead after work. I actually arrived in about an hour, which was quicker than I thought it would take. I got on my pack and started hiking into the canyon. There was no one else around and I would not see anyone else all evening…I had the place to myself. It’s great to be able to get to places like this not far from home to enjoy some solitude in the middle of the week. View from the trailhead over the Grand Valley in the distance. I made it to the end of the trail rather quickly which left me with plenty of time before sunset to take some photos. 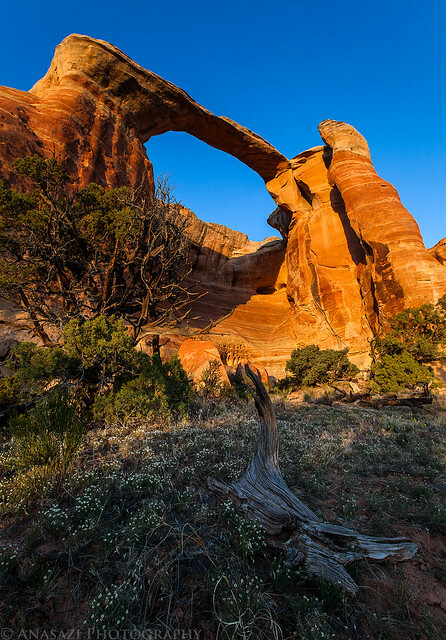 I went right to Rainbow Arch, also known as Cedar Tree Arch, at the end of the trail since I knew the light on that arch would be better earlier in the afternoon. Unfortunately, I was too late to catch it at the right time. I might have to return to this arch in the fall or winter for better light. 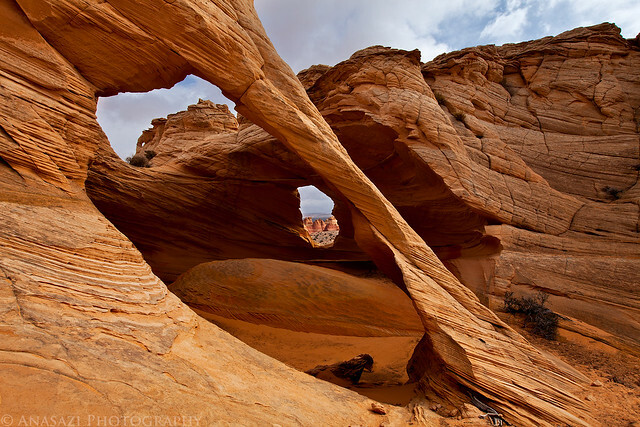 It’s been a while since I visited the arches in Rattlesnake Canyon and I’ve wanted to return to get some better photos. So after work on Tuesday I headed up there for a nice sunset hike. I made this photo of East Rim Arch, which is also known as Akiti Arch and Centennial Arch, shortly before the sun dipped below the horizon. The golden light on the arch was nice, but I sure would have liked a few puffy white clouds in the sky behind it! 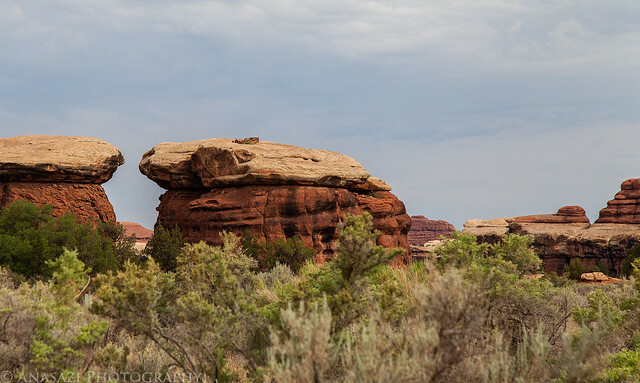 I’m working on the photos I took on my trip to Coyote Buttes North and South a few weeks ago so that I can put together a trip report from the weekend. 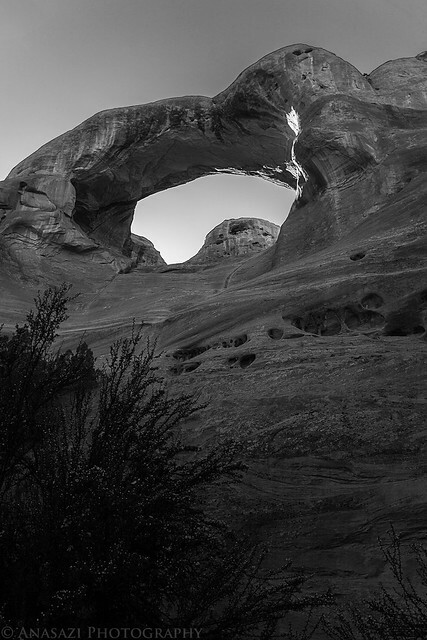 Here’s a photo of Melody Arch that I liked from that trip. If you look closely you can actually see three arches in this photo.